Texas Longhorns roamed wild near the Rio Grande and Nueces rivers for many years making them hardy animals which can withstand harsh climates, both cold and hot. They are able to live on rocky terrain and in small areas which usually provide little water and grazing. 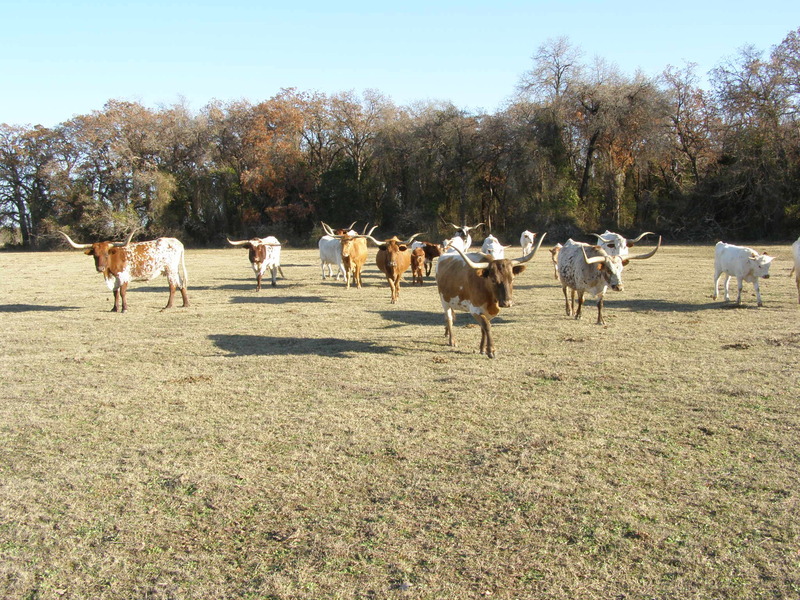 They are great for breeding and the longhorn is very disease resistant. Not only are they beautiful to look at, because of their lean bodies they contain little fat which makes them very desirable in the public beef market. Unlike most cattle breeds the Longhorn is a very docile animal around humans. On the other hand they are very protective of their young when it comes to coyotes, bobcats, pigs and other predators. When calves are on the ground one momma will stay with the young while the others feed. They take turns watching over the young and will even allow other calves to feed while their mommas are away. 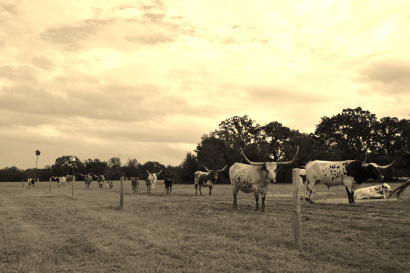 Lots of events use Longhorns not only because of their history and beauty but because of their gentle nature. They can be trained to ride and they make great show animal that are sure to win your son or daughter a blue ribbon. The Triple V Ranch takes great pride in providing quality animals for breeding and beef. 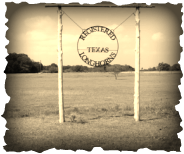 Our breed cows and bulls are all registered with the Texas Longhorn Breeders Association of America. We will provide transfer papers as needed, registration is available at an addition fee. Please look around our site for your interests, our Sale Barn is updated as animals become available for sale. We will soon have Ropers for sale so check back with us if you are interested. As you browse our breed, you can clearly see the beauty of these remarkable animals as a Texas tradition. 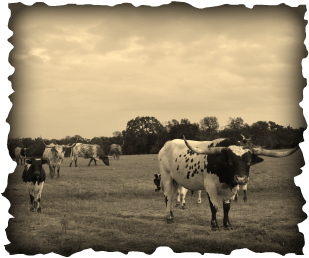 If you have 2 or 200 acres the Texas Longhorn is the way to go.